Finding the vibrating point on a hairspring is just the beginning. Now we have to pin the spring in place and keep it that way. Glue is not a part of watchmaking. The closest we'll get to adhesives (in a watch, at least) is the shellac that holds the pallet fork's stones in place. To hold our spring, we'll need to pin it to its collet. You can see the pin at the center of the picture, in the shadow. The vibration point on a hairspring should line up almost exactly with the place where it's pinned, so you have to do a little bit of math. Once you get the formula right, the spring has to be cut from the inside, and attached to the collet with a tiny (and I mean tiny) pin. Oh, did I mention that we're not allowed to use any kinds of cutting tools with these springs? 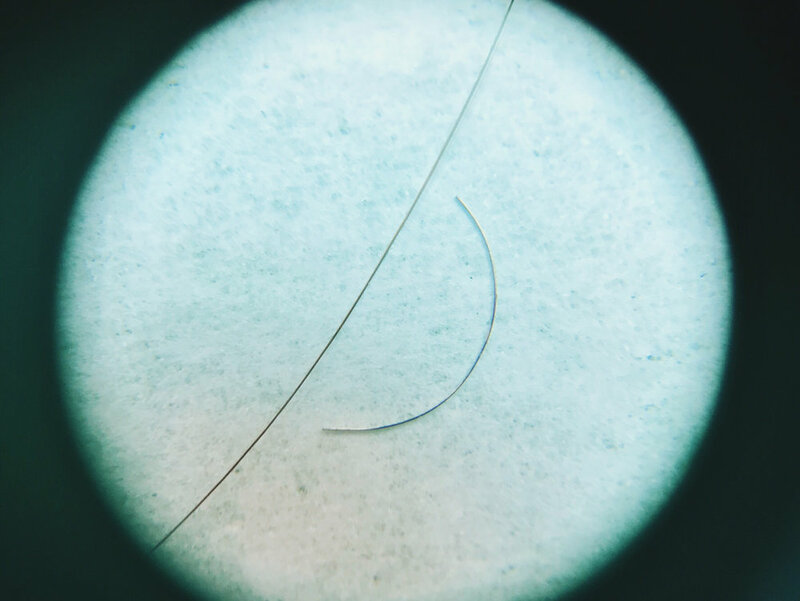 There are dedicated tweezers that can cut springs, but they're so thin that we're actually able to break them apart with our tweezers. Don't take my word for it, check out the thickness of the hairspring compared to one of my actual hairs. Yeah, it's thin. And this is a "thick" hairspring. The pin is similarly tiny, and has to go in a tiny hole. All of this has to be achieved without scratching anything, because 1) it may be visible, and 2) damage is not allowed in watchmaking. This was one of the trickiest parts of the process for me. To pin the spring, the collet must be mounted on a post (we use our smoothing broaches, which you'll meet in a different tools post), the inside tongue of the spring must go through the hole on the collet, and the pin must go through to friction-fit it all in place. For these exercises, we're using our higher-magnification loupes, either the 10x or the 6.7x. I tend to prefer the 6.7x for the larger depth of field and field of view, but to each their own. One of the trickiest parts of pinning the hairspring is that the pin is just barely thicker than the spring itself, and it is not very strong. Brass, at this scale, is practically plastic, so the pin has to be inserted perfectly straight or it will bend, ruining it. All of this is done with tweezers, just inches from your eyeball. It's like using tongs to tie your shoelaces. Luckily, it's possible. And then the fun begins.